Great reviews for The Mystery of Nida Valley series. I first read THE MYSTERY OF NIDA VALLEY as a manuscript and then again recently in its final form. It is truly a story that has everything. In it we find time travel, dinosaurs, mythical creatures, Mega fauna from Australia’s past, magic, ghosts, good guys and villains, all wrapped up in a fast-paced action-adventure story with a dash of romance to boot! What young reader isn’t going to find something to love here? But it’s one thing to fill a story with many amazing things and creatures. The real trick is to draw the reader in and make it all believable, engaging and exciting. Elaine has done just that. The story is set in the lush rainforests of Queensland where the magical and hidden valley of Nida and its strange wildlife have been protected for generation upon generation by a secret group who called themselves The Guardians. It is a world that we want to explore and in which imaginations can run wild. The secret valley with its exotic fauna and flora has a character all of its own. One truly unique feature of THE MYSTERY OF NIDA VALLEY is the inclusion of Australia’s ancient Megafauna. I don’t know of any story that has incorporated these amazing creatures before. It’s wonderful to think that while being thrilled and entertained by a story, young readers will also be finding out about the unique animals that once roamed our continent. Animals such as giant echidnas and giant wombats, Carnivorous kangaroos and marsupial lions to name but a few. Into this amazing world is thrust a group of ordinary teenagers led by the likeable and feisty Meg Sealy. They discover to their surprise and delight that they are the next generation of Guardians and that their destiny is to protect the wonders of Nida Valley from those who would exploit and destroy it for their own greed. And so, the battle lines are drawn for a series of intriguing and gripping adventures. As well as the main character of Meg, Elaine has created a varied bunch of appealing and believable companions who must not only struggle with the everyday challenges of normal teenagers such as growing up, relationships and working out what is right and wrong, but also with the extra challenges of their new found roles and responsibilities. Things like: how to ride a pterosaurodon, how to avoid getting eaten or crushed to death by mega fauna, how to handle their own newly acquired magical powers and talents and how to live up to their important positions as protectors of a fragile and precious valley and the wondrous treasures it holds. The Mystery of Nida Valley is a cleverly written adventure fantasy tale that I’m sure will entertain, inform and delight younger readers and leave them eager and impatient for the next instalment. Michael Gerard Bauer – author of: The Running Man – Don’t Call Me Ishmael! – Ishmael & the Return of the Dugongs – Dinosaur Knights – You Turkeys! – Just A Dog – Ishmael & the Hoops of Steel and many more. The Mystery of Nida Valley joyfully brings us a classic situation – a secret place alongside our world but hidden, a place of magic, adventure and startling inhabitants, but it does so with a welcome twist. It’s pleasing to find such a fantasy grounded so well in an Australian context. No vague ‘otherworld’ here, The Mystery of Nida Valley is solidly set in Queensland. The primeval creatures that are hidden in the valley are drawn from detailed research of Australia’s rich but neglected palaeontology and add to the consistency of setting. Dangerous creatures lurk, challenges must be overcome, initiations into a secret society of guardians must be undertaken, all against the lush and rich background of the magical valley. Nida Valley is more than a location, it’s a character in its own right. In other ways, this is a coming of age story, with young people gradually discovering the true nature of their world. The key characters begin as children, protected and unaware. Throughout the book they learn the secrets of the world and their vital role in it. Their transition to awareness is – naturally – a testing one, fraught with perils that are both mundane (political shenanigans) and outlandish (attacks from deadly prehistoric animals). A key to their growth is the discovery of freedom through the means of flight. This exhilarating liberty, however, comes with its own demands and trials, a central part of the book. 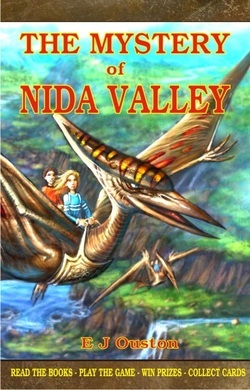 The Mystery of Nida Valley is a magical fantasy adventure in a detailed and rich Australian context. Michael Pryor. Author of The Laws of Magic series and much more. Pull up your seat, for you are going on a fantastic journey that you’ll soon not forget. Captured – Book two in The Mystery of Nida Valley series is more than a story about a magical, mystical encounter by a girl who stands to inherit enormous powers; it’s a family journey of love, history and about our own natural instincts to preserve our own heritage, as well as that of extinct animals. It’s a story about prehistoric animals who roam the hidden valley dependent on human preservation by a magic Order. And because of the presumed extinction propensity, reading this epic novel makes you want to preserve these species too. Meg is the perfect candidate to lead this group of interesting characters. The author does a sensational job of intermixing old tradition with the new. And the fantasy aspects of this story simply keeps you turning the pages as you go along with Meg and her friends to find the missing pteros, save the wombats and to learn the truth about why Grundymere wants to capture her – and why Dragon Lady, Miss Cashmere, hates her and has Sophie snoop to find out the extent of Meg’s power. You also want to know if Meg will use her power responsibly, and not take advantage of the gift that others don’t have. As time goes by, the readers will be happy to learn how responsible a teen Meg is. Meg’s journey of preservation and discovery is breathtaking! Her love for the valley is highlighted by her love of learning and discovery. You’ll enjoy searching for the giant megafauna wombat’s and missing pterosauradons with Meg. And you’ll laugh at being invisible with Meg and her friends, and a whole lot more, because she is simply an adorable character who makes us believe. This is a well written saga, and the end will be a great surprise to all who believe, and don’t take things at face value. This book is well edited, and researched. The author makes it fun and educational to learn about prehistoric animals. After reading this beautiful book, and seeing how people who lived in one time, acted as they met up with real people who had time traveled back from decades ahead, I only wanted more! Meg won my heart. Ms. Ouston has certainly won a new fan in me! “Captured” is the second book in The Mystery of Nida Valley series, but even if, like myself, you haven’t read the first; the events prior are explained enough that you won’t be left feeling lost. Our protagonist, Meg is an absolute delight to get to know and the adventure she takes us on will leave you on the edge of your seat. Packed to the brim with magic, mystery, the ultimate bad guy and unwavering friendship, “Captured” is the ultimate story to re-affirm or develop your love for all things fantasy. The plot is timed perfectly and the world and characters are all well developed and the scenery vivid. This is truly and all ages book. While it is aimed at older children/ young teens there is plenty to delight adults as well. The only downside? Well it will leave you desperate for more, and eagerly anticipating reading its predecessor. Bring a little extra magic to your life and take the leap into Nida Valley – you won’t regret it.